I want to start with a quick joke. Two friends are in a restaurant. The waiter asks, “Can I take your drink order?” One man says, “I’ll just have some H2O.” His friend says, “I’ll have some H2O too.” The waiter brings the drinks. The first man enjoys a nice glass of water, but the second man dies. This comic illustrates the importance of seeking medical advice from your doctor before making changes to your life. Because sometimes what is said is not the same as what is heard. With that, I would now like to talk about health in a systematic structure (table below). These are the four major areas of interest: metabolism, immunity, circulation, and mentality. Historically, four things, hunger, germ, hard labor and purpose, have each been closely associated with one of the four systems. On the other ends of inevitable things are the “ideal” conditions man has been striving for, fullness, clean, rest, and freedom. The four inevitable things have been associated with human life since the beginning of our species. They are considered inevitable because they can’t be avoided due to limited food, knowledge, and technology. However, human body has also evolved to be hardwired to these inevitable and “ideal” conditions, as it has done to day and night. The progress of civilization in the last several centuries has removed the limit of food, uncovered advancements in the medical field, invented technologies to use in place of human labor, and made it much easier to achieve our previous goal of surviving. What was previously inevitable is now evitable. Many people are fortunate enough to have the luxury to choose to live in an environment with “ideal” conditions. However, our bodies are still the ones that have evolved to withstand hardships and strain. 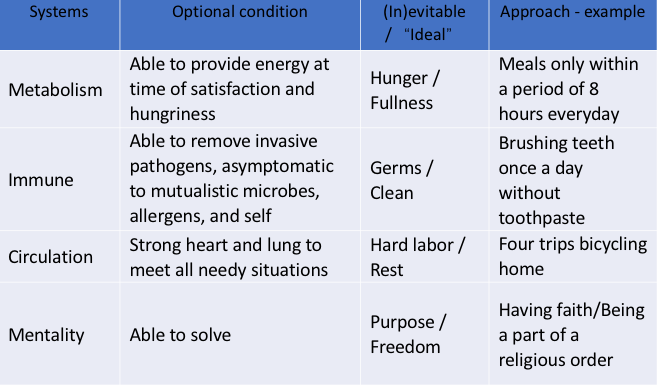 The mismatch between this new environment lacking in hunger, germs, labor, and purpose and the body constructed for those conditions is the biggest challenge needed to be overcome for a healthy life. First, let’s talk about health as it pertains to metabolism. I have two scenarios to walk you through. In the first scenario, it is ten in the morning and you are hungry. What do you usually do in this situation? In the second scenario, it’s ten in the morning and a lion is hungry. What do you think the lion does in this situation? You probably answered that you would prepare something for yourself or go shopping, and that a lion would hunt for his meal. 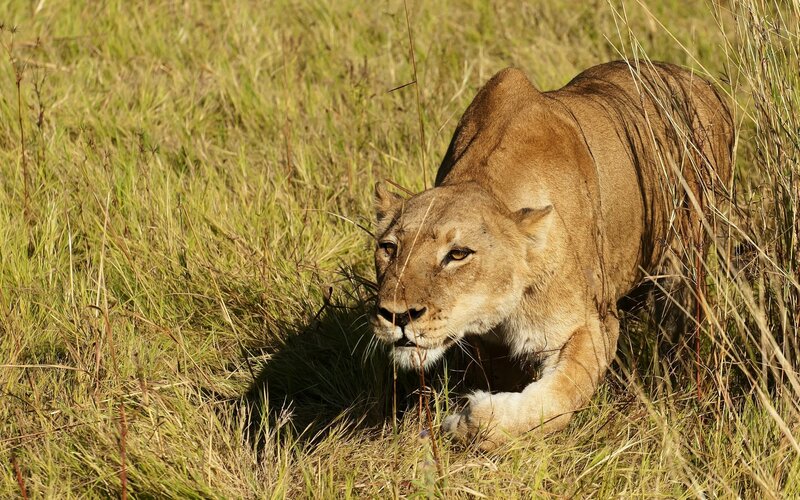 Generally speaking, a lion goes hunting when it’s hungry. Hunger is a call to work in nature. Even for humans, eating three meals a day was not considered the norm until very recently in history. In fact, one or two meals a day was the common practice not so long ago. In my own early life, we used to eat only two meals a day. The first thing adults and children did in the morning was to go to work and school, respectively. The first meal was served from 9 – 10, after which we would return to our duties. The second meal wasn’t until the late afternoon. In winter, it was common to only eat one meal a day. I started eating three meals a day in my early teens. However, eating a meal first thing in the morning wasn’t part of my morning routine until after I graduated from college. Snacks entered my as a luxury while in my twenties. In my thirties, after moving to the US, food was more readily available to me than I had ever experienced before. Hunger could be satisfied at any moment with fast food, instant meals, or sugary drinks. But even with such availability of food, my sense of hunger became uneasy and agitated. I felt compelled to eat more and more. The sooner I ate after beginning to feel the first pangs of hunger, the bigger my appetite became next time. I began to gain weight. I developed hypertension in my early forties. My blood pressure fluctuated as I wrestled with my condition for quite some time. In the process, the concept of fasting came to me with help from several books. I attempted a 72-hour fast but my strong stomach acid prevented me from finishing and I stopped at around the 40th hour. In the summer of 2016, I practiced eating two meals within a short period of time each. My weight loss was visible within a short period of time and my blood pressure could be maintained easily by exercising regularly. Another benefit is that my hunger has been tamed. The urge to eat has become less demanding. After four weeks of taking my meals within a window of 8 hours, I took a blood test at my yearly checkup. Compared with the results from a year ago, it was much improved: blood glucose was reduced; total lipids and LDL were lower; the HDL became higher (table below). But most importantly, I felt better both mentally and physically. In fact, it’s likely that our bodies were built to function better under the duress of hunger. In my research, some publications indicated that fasting actually strengthens immunity and memory. Traditionally, the two stages of satisfaction and hunger alternate with each other. Different metabolism applies in each of the two stages, which involve different parts of the metabolic system and likely hundreds of genes in different organs and tissues. Balance of the two stages will exercise the different components of metabolic system. Many people in this country are missing one half of this balance: hunger. This is likely the cause of many health problems today. The next time you feel hungry, try to remain hungry for a longer period of time. Condition yourself to find the proper balance between hunger and fullness. Second, let’s talk about health as it pertains to the immune system. Contact with germs, good or bad, is inevitable. This has been true for human beings since we began to exist. Our immune systems helps us survive in a world full of germs. The most common problem with the immune system is allergies, encompassing seasonal allergies as well as food allergies. This is definitely a problem here in US, which I’m sure many of us can attest to. I have been living in the U.S. for over 20 years and spent most of my time here without suffering from any allergies. People told me, “You’re safe if you don’t have it within the first 5 years.” And I was safe until my 18th spring here. My allergies began during a retreat one evening in the March of 2014. I started tearing up during a talk. When I went outside, more tears arose accompanied by sneezing and a tightness in my chest. I realized my tears were caused by the pollen from the surrounding trees. The most difficult symptom of my allergy was the congestion of my nose during the night. Many nights became sleepless ones. And even worse, my allergies grew from seasonal to yearlong. I looked into what might be the cause of the allergies. My surroundings had remained relatively unchanged, so it must have been something inside me that was different. My genes were not to blame. My food, mostly home cooked Chinese food, had changed very little. My weight had increased slowly for the first ten years here and had remained relatively stable ever since. The most drastic change I had made was concerning my oral hygiene. After ignoring advice from my dentist for many years, I finally started flossing daily in 2013. I was also using mouthwash and scraping my tongue. In January of 2014, I finally got an A+ at my dental checkup. No more advice was given. Beside these changes to my dental hygiene, the antibiotics I used in the winter of 2013-2014 to combat a lasting cough are likely another contributing factor. The combination of excessive oral hygiene and antibiotics had changed my oral microbiome in a profound way. Around that time, research about links between oral microbiome and allergies were gradually emerging. Beyond my personal story, there is an observed association between allergies and oral hygiene at a societal level. 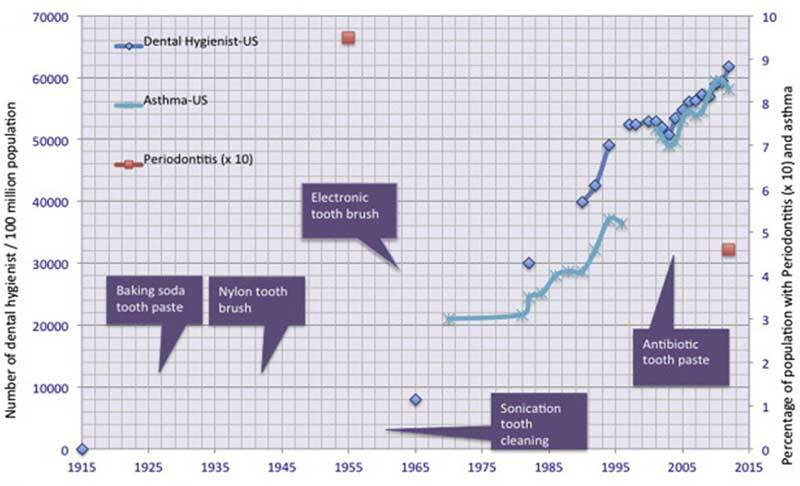 For example, this chart (right) shows an association between allergies and number of oral hygienist in the U.S. The number of oral hygienists in the US is used to indicate a level of public oral hygiene. Asthma is the representative of allergic diseases. This data was publicly available at the NIH and Department of Labor. The association of the two data sets is highly significant. Without being restricted by any particular theory of operation or making any specific health claims, it is believed that oral microbiota interacts with the host largely through metabolites produced by its relevant bacterial members. Those metabolites, including but not limited to the short chain fatty acid, may influence the function of multiple biologic systems and organs, such as the immune system. Absence or severe reduction of the relevant bacteria may cause the immune system to malfunction, possibly by causing an oversensitivity to allergens. It is believed that the immune system’s response to allergens may be regulated so that the associated allergic symptoms are suppressed relative to what an allergic reaction could gully amount to. Evidence has further suggested that promoting healthy oral microbiota with certain substances may allow the immune system to function in a healthy manner with a healthy response to allergens. Furthermore, due to the connectivity among the mouth, respiratory duct and lungs, healthy oral microbiota may lead to healthy microbiota in the lungs as well. Eventually the method may benefit the immune system which will in turn have a healthy response not only to allergic rhinitis but also relevant diseases affecting the lungs, such as asthma. Beyond the respiratory tract, similar relationships between the immune system and microbes likely exist. For example, many bacteria in the gut produce short chain fatty acids and research has found less showers are associated with less skin allergies. Further examinations found that autoimmune diseases are close cousins of allergies rooted in related causes. The lesson we have learned so far is that it is not necessary for one to go to extreme lengths to maintain personal hygiene. While researchers are trying to define the proper degree of hygiene practices, common sense can be applied in many situations. For example, one should shower less frequently upon observing dry or itchy skin after prolonged showers. Also, knowing the breeding grounds of “bad” germs is important. Third, let’s talk about health as it pertains to circulation. The inevitable related to circulation is labor. Hard labor was required in history not only to feed family members but also to defend one’s land. Such physical work not only strengthens muscles but also exercises the heart and lungs. The Industrial Revolution has relieved many people from hard labor. Thus, modern-day human beings are required to exercise (labor without any external purpose) if they want to remain healthy. Exercise is more beneficial when not used for weight loss but for a strong heart. Physical activity consumes limited amounts of energy in comparison to basic metabolism. For example, walking for an hour consumes only the amount of energy in a cookie or bagel (only 55 grams). Additionally, it’s easier to exercise when doing so for an ulterior purpose such as meeting friends, walking a dog, commuting to work, or even household chores. Exercise solely for health’s sake can become very boring. Health has no purpose above your happiness and fulfillment. Forth, let’s talk about health as it pertains to mentality. Mentality is obviously a complicated issue with much written on the topic. I would like to relay to you some segmented thought on the inevitabilities of purpose and faith and why they are important to mental health. The human brain was evolutionally selected to solve problems and answer questions. Purpose is the driver of the process. Nothing in history has been done without purpose. Historically, the main purpose for man has been to survive. According to Maslow’s hierarchy of needs, other purposes are secondary to survival and are related to different level of human needs, from physical to social to mental. The pursuit of self-actualization satisfies the highest need of the human soul. The inevitability of faith stems from the enabling functions of the human brain. The following three brain functions are said to be the foundation of developing faith: the ability to infer the presence of organisms that might cause harm (agent detection), the ability to come up with causal narratives for natural events (etiology), and the ability to recognize that other people have minds of their own with their own beliefs, desires and intentions (theory of mind). These three adaptations (among others) allow human beings to imagine purposeful agents behind many observations that could not readily be explained otherwise, e.g. thunder, lightning, the movement of planets, complexity of life, etc. The emergence of a collective religious belief identifies the agents as deities. These explanations were later standardized and became widely accepted. I want to emphasize that we should not conflict, confront or replace faith with science, or vice versa, because they are two separate scopes within the human perception of the world. Man knows the world through two processes, sense and imagination. In reality, the two are always applied together in order to perceive the physical world. Science mostly relies on the senses to prove a hypothesis derived from a limited imagination based on what is known. Religious belief is mostly imagination (faith) with the limited support of the senses. Historically, religion facilitated the development of imagination and led to the birth of scientific hypotheses. In a sense, it can be said that religion is the father of science. Faith is the basis of a healthy and abundant life, the result of evolutionary selection. In ancient times, faith was a simple explanation for environmental phenomena. Among the uncontrollable, faith gave people something to grasp onto. Do we still need faith nowadays? If you do not think that science has enabled you to understand and to control everything, if you are not certain what your tomorrow will be like, faith can still provide an anchor. Just as Mark Twain put it in The Adventures of Tom Sawyer, “Earthly pleasure cannot satisfy the longings of the soul!” Material that is sensed can only satisfy the need of the sensing mind. The imagining mind can only be satisfied by human imagination. And the greatest of all human imagination is religious faith. Finally, this summarizes the message I have discussed with you today. In evolution, there is a phenomenon in which anything inevitable to life will eventually solidify into necessity. All four things – bacteria, hunger, labor, and faith are inevitable for human being. And human civilization during the last two centuries has made the previously inevitable evitable. Hunger, bacteria, and physical exertion have been part of our beings since the beginning and are likely still necessary and a key component of our bodily health. At the very least, they are not going to be eradicated in the near future. To lead a healthy life, we need to maintain these things properly. First of all, we should control the balance between hunger and satisfaction. Historically, humans have lived under conditions of periodically uncontrolled hunger due to the limited availability of food. Instant satisfaction or the complete removal of hunger halts the molecular machine for metabolism in hunger and may cause it to malfunction. Second of all, we need to make peace with bacteria in and around us. A major issue concerning the health of the immune system is that essential bacteria become vulnerable due to excessive hygiene practices. These bacteria can be removed or reduced significantly, especially while we fight infectious diseases. The absence or reduction of the essential bacteria can cause a malfunction of the immune system. We discussed oral bacteria as an example, but there are also beneficial bacteria on our skin and in our digestive systems as well as in the environment around us. Your immune system can only function properly under the proper influence of bacterial interactions. Otherwise, problems will develop, not only in the form of allergies, but also in the form of autoimmune diseases. Third of all, remember to exercise properly. Fourthly and finally, finding a purpose or a faith is a necessity in the pursuit of self-fulfillment and mental health. This has become even more important in modern society because the goal of survival has become much easier. If anything, take these messages with you: starvation can kill you but fasting will make you healthier. Pathogens can sicken you but most bacteria make you more formidable. Hard labor can cause injury but frequent physical work makes you stronger. Superstition can make you a fool but faith will give you hope. So remember these four things: fasting, bacteria, exercise, and faith. Then apply them according to your own needs and balance them with their “ideal” conditions, fullness, clean, rest, and freedom. They will elevate you to a healthier and happier life, and one rich with mental, physical, and emotional accomplishments.